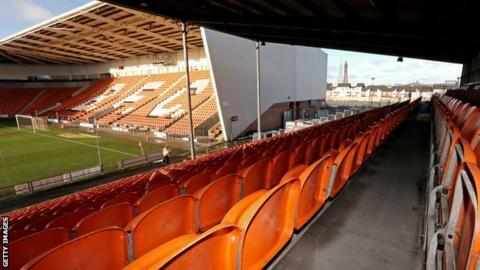 The English Football League say they will work with the newly-appointed receivers of Blackpool to ensure the club fulfil their fixtures this season. David Rubin & Partners are due to be confirmed as receivers of the League One side this week. Blackpool were put into receivership by the High Court last week, forcing owner Owen Oyston to pay ex-director Valeri Belokon the £25m he is owed. The EFL must also decide whether to dock the Tangerines 12 points. "We hope to find a solution that will deliver the stability that will benefit the club going forward," EFL chief executive Shaun Harvey said. "The board [of the EFL] will receive an update at its next meeting on 6 March and we will look to bring the matter to a conclusion, as quickly as possible." Paul Cooper of David Rubin & Partners is set to take day-to-day control of the Bloomfield Road side once the company's appointment is confirmed by the High Court. It is reported he will be asked to discharge some of Oyston's assets, plus those of Blackpool Football Club (Properties) Ltd - which owns the football club, stadium, training ground and nearby Travelodge. In an open letter published on Monday, Harvey reiterated his intention to "return the focus of the club's supporters to the performance on the pitch rather than activities off it", which he previously stated in a meeting with Blackpool supporters in March 2018. However, Harvey said the imposition of a 12-point deduction - which would see the club drop from eighth to 16th on the basis of current standings - was not necessarily mandatory despite the club going into receivership. "The EFL operates inside a regulatory framework that governs our approach to matters," Harvey said. "It is this framework that has often frustrated parties who think we should have done more with regard to the ownership of Blackpool FC, and is now the same framework that provides the flexibility for the board, to determine if a sporting sanction of a 12 point deduction is to be enforced. "It is not mandatory that the 12 point sanction must be applied but the circumstances of the appointment of the receiver need to be fully considered and the appropriate decision taken in accordance with the regulations."